They call themselves “students of pizza,” and you’ll want to study all the different varieties at Slice Box Pizza just a couple blocks from Safeco Field. The husband and wife who own Slice Box Pizza in Sodo aren’t your typical restaurant types. They don’t have fancy culinary pedigrees. Nor are they pulling from a beloved grandma’s storied recipes. Ryan and Leanna Lengle just did their research. “We’re students of pizza,” Ryan said. They’d owned a hydroponic garden shop in Sodo since 2010 and noticed a shortage of lunch spots in the neighborhood. When they stumbled upon a great deal on restaurant equipment, they decided to go for it, downsize the garden store and open a pizza place. Months of research and development ensued; they studied pizza history, followed pizza forums, ate plenty of pies. Their studiousness has made all the difference. The sauces are vibrant, the crust nicely springy and flavorful — almost sourdoughy. And they’re not afraid to take risks with their chef’s choice varieties (on my visit, a garlicky concoction with spinach, chicken, pesto, tomatoes and sunflower seeds). The Lengles have a few dreams. One, to use their gardening knowledge to grow basil and tomatoes for use in the kitchen. Two, to create a business in which someday their 5-year-old son Evan, who has Down syndrome, and others like him can do job training. And three? The menu: They keep it simple: pizza (by the slice and 18-inch whole pies) and salads. What more do you need? Well, beer, of course. They have Manny’s on tap (growler fills to-go) and canned options, too. 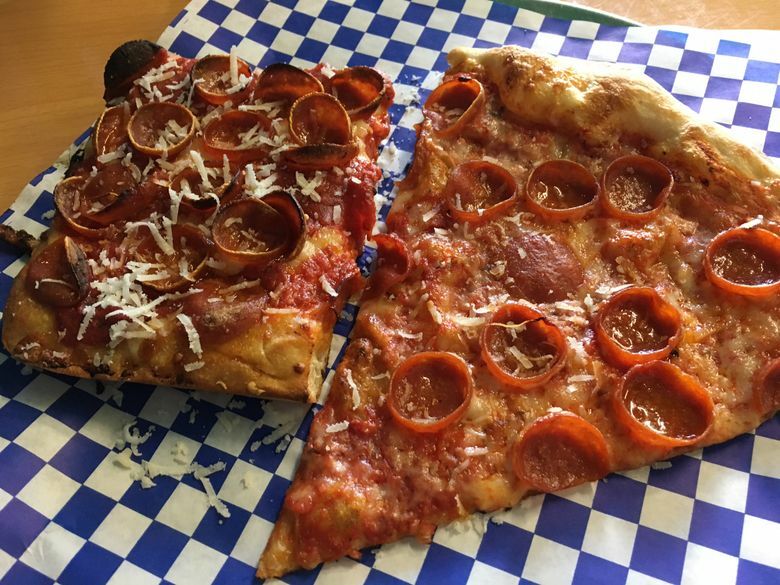 Don’t miss: While the New York-style pepperoni slice was good, the real winner is the Sicilian pepperoni. The thick, square slice (Leanne may even sweetly ask if you’d like a corner piece or the center!) has a spicier tomato sauce that’s bright and leaves a lingering zing. If you’re feeling a white pie, the White Basil is a good bet, with pesto, goat cheese, sun-dried tomatoes and, again, plenty of garlic. The space: It’s charming, in part, because of its lack of charm and warehouse feel. Bright green-and-yellow walls are an homage to the Seattle Sonics (hey, it’s right by the potential Sodo arena location — they can’t be too prepared). A to-go window opens out to the sidewalk for grabbing a quick slice. A tip: The official hours are from 11 a.m. to 6 p.m. Monday-Saturday, but you may find the window open later or during games. Stop by and see! Prices: Four good-sized slices of pizza (one $3.65, three $4 each) and a small arugula salad ($4.95) totaled $20.60, before tax and tip, and stuffed two nicely.